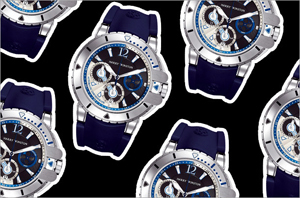 Summer – the time of the ocean, divers and diving watches! Let me first introduce you to the novelty of a young watch company Helson, based divers and underwater sports enthusiasts from Europe and Asia. New – watch Titanium Gauge, presented in a titanium casing with the main and most important indicator of the deep hours – an impressive indication of water resistance – 1,000 meters! As the representatives of the company, feature clock became not only an indicator waterproof and titanium body and is equipped with a helium valve descent. Housing, among other things has a double sapphire crystal with anti-reflective coating. Winding head diameter is 7.9 mm. In addition, the new product differs from other models Helson much smaller body. Thus, the width of the body Titanium Gauge – 47 mm, height – 16.8 mm. Watches Titanium Gauge weigh 130 grams, and is engraved on the back cover image of a diving suit. As for the colors used for the external design of the model, we should note that they are quite restrained. Titanium case – gray dial – black. Pretty boring and unremarkable combination, especially for watches that are designed for the depth and specificity of its “demand” in the brightness of the design. Another, in my opinion, an unnecessary complication, and watch “refinements” – minute time indices instead of hours. Well, that carried away by the originality, the producers have not forgotten about the vital importance for the deep hours of a luminescent coating. But I was just in passing. As far as the technical basis, the clock mechanism are based on the ETA 2824-2. Strap – in the style Isofrance, with a clasp engraved with Helson. Buy Watches Titanium Gauge can be $ 899 in stores Helson.